Home | Starkweather Roofing, Inc.
Starkweather Roofing featured in US Builders Review! Welcome to Starkweather Roofing online! Starkweather Roofing is a family-owned commercial roofing company with beginnings over 25 years ago. Our service area includes Arizona statewide, Albuquerque New Mexico, and El Paso Texas. We offer new roof construction, roof replacement and recover, roof restoration, and preventive roof maintenance for industrial, commercial, educational, medical, government, military, and institutional facilities. We love hearing from customers! 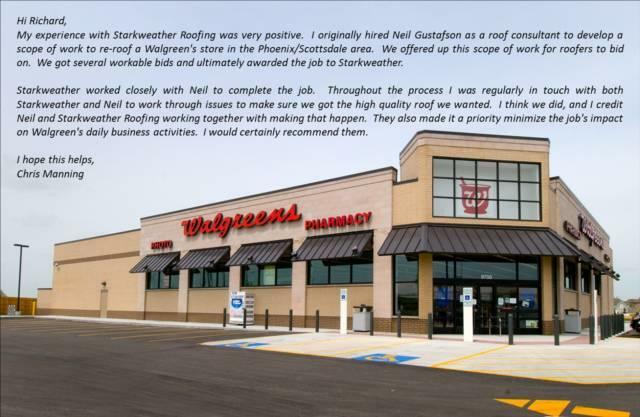 Below is a comment from a former client (who owns a Walgreens building we replaced the roof on) sent by someone we submitted a bid to in support of hiring Starkweather Roofing to replace the roof of his Walgreens building. Thank you for the kind words, Mr. Manning - we were recently awarded the contract! Unlike most roofing contractors, we don't just install and promote one type of roofing. Starkweather Roofing provides multiple roofing options to find the best solution for your roofing project. Starkweather Roofing is certified and experienced to install all types of roofing systems including built-up, modified bitumen, single-ply TPO, PVC, and EPDM membranes, metal, foam, coatings, cool roofs, green roofs, shingle, tile, bermuda, and below-grade waterproofing from top brand manufacturers. 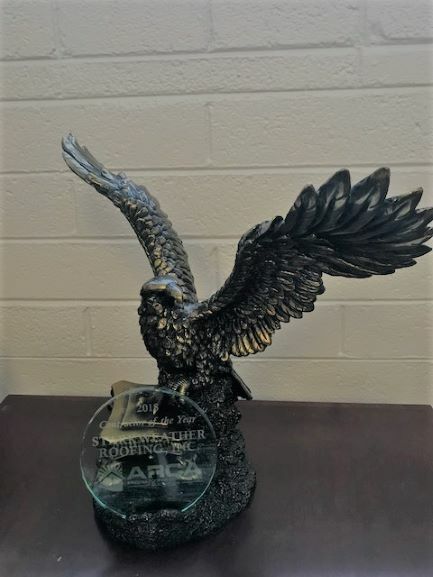 Starkweather Roofing is a certified applicator for nearly all roofing system manufacturers including Johns Manville, GAF, Firestone, Duro-Last, Carlisle, Tremco, United Coatings, KM Coatings, Republic Powdered Metals, Bayer Material Science, and Eagle Solar to name a few. 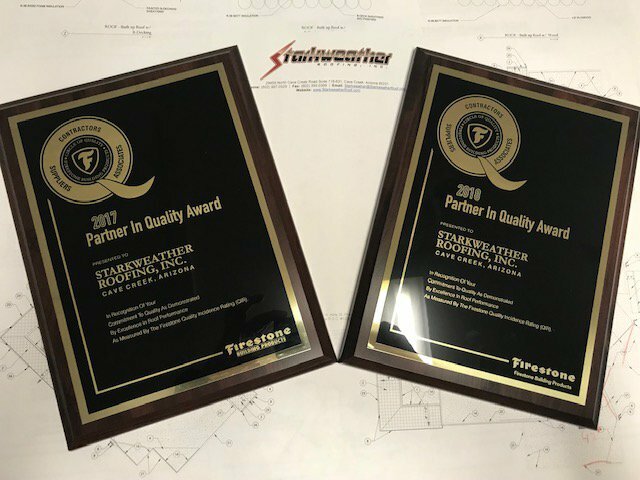 We were awarded the Firestone Building Products Partner in Quality Award for 2013 and 2014, recognized with the Master Contractor Award by Duro-Last for 2014, and GAF Master Select Commercial Roofing Contractor for 2015 (only 3% of all roofing contractors achieve this status). Throughout our years of experience in the low-slope roofing industry, we always emphasize our unparalleled quality of workmanship. We provide guaranteed quality products, professional workmanship, and personal attention to every project large or small. We serve a broad range of businesses and public entities throughout the area, working directly with and meeting the needs of architects, general contractors, building owners, developers and management companies. With extensive experience, our office and crew members have a commitment to innovation and our focus has always been to produce the best roof possible with the most cost effective strategies. This is accomplished by utilizing only the most advanced application processes, products, and technologies to eliminate waste and enhance productivity. We take a professional approach to installation, maintenance and repair of roofing systems. Our services are marked by quality workmanship and personal attention to detail. Although we adapt our work to specifications and blueprints created by structural engineers and architects, we often take a consultative role with our customers. We will help you choose the right roof for your project by considering a range of factors such as long-term maintenance costs, building uses, environmental impact, and ease of installation.